Sally Lampi is the most amazing character and a very nice woman. In addition to designing fun dolls she also is an extremely talented artist. 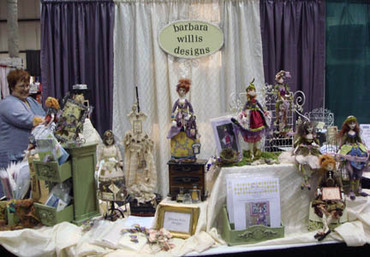 Betts Vidal's booth of gorgeous dolls. I didn't grab her to take a picture of her but you have to take a look at her sweet little faces. She's especially fond of little noses and large ball gowns for her ladies. Not a good picture because I rushed it, but here's the infamous doll designer that started my love of making dolls - elinor peace bailey. Did you know that she's the MIL of a certain Heather that we all know and admire? 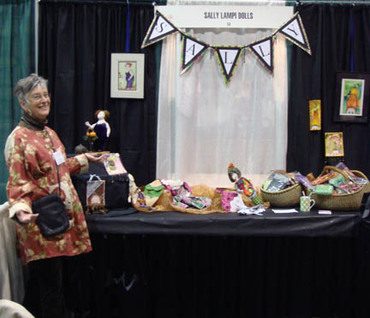 Luckily in addition to her doll patterns, elinor was also selling fabrics from Heather and Tina Givens. Since I haven't really seen a LQS that sells those fabrics I snatched up a few half yard cuts. This was a display set up by one of our club members, Colleen Patel. Aren't these amazing dolls? 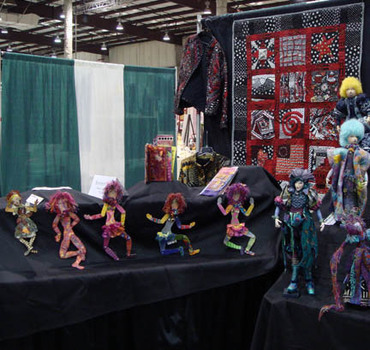 She just recently made her own pattern and will be teaching it at the quilt show in Manteca, CA. 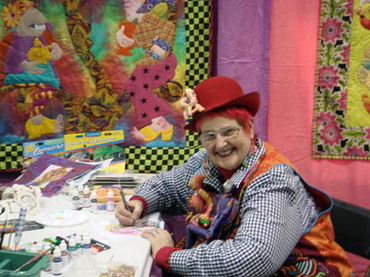 As you can see, she LOVES color and was inspired by the art of James Christensen. 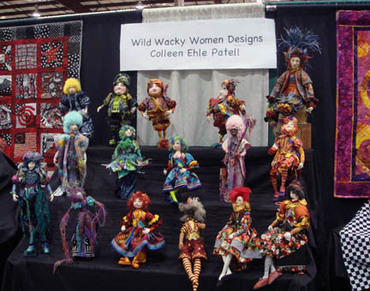 Colleen also is an active member and former president of the Flying Phoebes doll club in Hayward, CA. 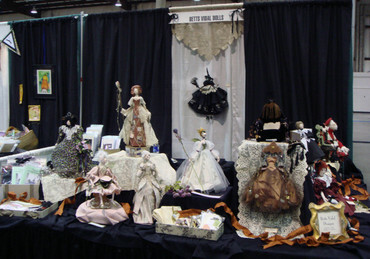 Here's the doll display from the two local doll clubs, Gals and Dolls and the Flying Phoebes. 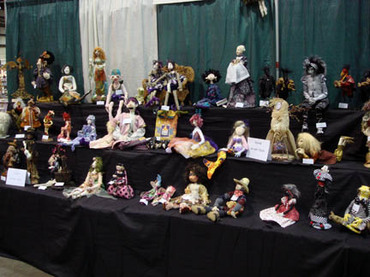 We also have a few items for sale - fabrics, dolls, pins and kits. 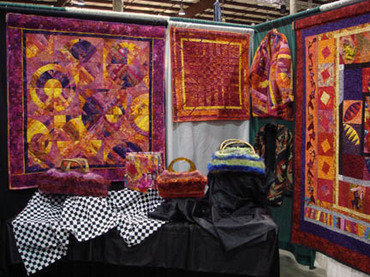 So if you're in the Northern California area come to the San Mateo fairgrounds today and tomorrow for the show. Info can be found here. Tomorrow I'll post pictures of the goodies that I bought.